I was in Coventry Cathedral recently to speak at “Rising”, the annual Global Peace Forum. The gathering brought together politicians, academics, lawyers and local people who are interested in how lessons, learned in a peace process in one part of the world, might assist in another one elsewhere. Coventry Cathedral is an inspiring setting for talking about war, and its dire consequences. The original cathedral was heavily bombed in 1940 during World War Two, but, instead of restoring it, the ruins of the old cathedral have been preserved in their post bombing state, as a mute but eloquent testimony to the horror of war. A new cathedral was built beside the ruins of the old one. 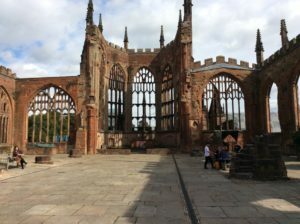 Coventry was also the venue for an IRA bomb attack in early 1939. Among the peace processes discussed at the conference were those in Liberia, Rwanda, Colombia, Bougainville, Northern Ireland, Iraq, and Libya. Some peace processes have been more successful than others! I spoke about the Irish case. The core problem from the beginning was the definition of “self-determination”. Was it to be self-determination by Ireland as a single unit, or as two or more units? I said that the uncompromising character of the declaration of a 32 county Irish Republic in the 1916 Proclamation, and in Dail Eireann in 1919, made subsequent compromise by self-declared Republicans very difficult indeed. As a result, anything less than a full 32 county Irish Republic, was claimed by some of them to be a betrayal of the declarations of 1916 and 1919. That gave them an excuse to go on fighting and rearming. The solution, worked out in the 1990’s, was a new act of Irish self-determination, in the form of simultaneous, but separate, referenda on the terms of a new Agreement in both parts of Ireland. This new Agreement, the Good Friday or Belfast Agreement, was approved in the referenda in both parts of Ireland. It has been accepted by most Republicans as a new act of self-determination, replacing those of 1916 and 1919. The Good Friday Agreement sets up an elaborate system for protecting the minority in Northern Ireland, whether that is a nationalist minority in a Northern Ireland that is still in the UK, or a unionist minority in a Northern Ireland that might, at some time in the future, be in a United Ireland. Either way, minorities would continue to be protected by the Agreement, and Northern Ireland, as a distinct entity with special rules, would continue to exist. Given the trouble that was taken to craft this complex settlement, it is irresponsible of the two main parties in Northern Ireland to decline to operate the Executive and assembly which are integral to the Good Friday Agreement. The scale of subsidization of public services in Northern Ireland by the rest of UK is liable to be questioned, if this refusal to operate the Agreement continues, and there is fiscal crisis in the UK.